Spring to fall, the lightweight, yet durable chambray fabric is a go-to shirt construction for many men around the globe. 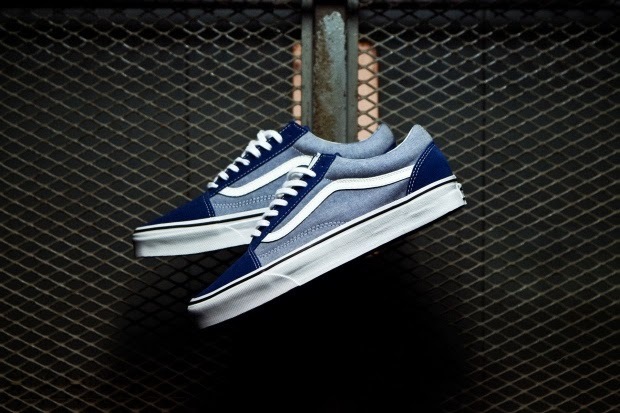 So for its 2014 spring Classics collection, Vans chose to apply the aforementioned cotton material to its iconic Old Skool sneaker silhouette. As a blue suede adorns its toecap, eyestay and heel counter, chambray pairs nicely at its midfoot panel with a white side stripe and stitching. Additional details include metal eyelets, a padded chambray tongue, and a vulcanized waffle sole unit. This Old Skool iteration is currently available through the Vans webstore in both black and estate blue for $65 USD.